I’m sure we can all agree that our kitchens are the heart of any home. Its where we spend the most time as a family. This often leads to an unkept kitchen that’s ready to topple over with mess and unnecessary things. Taking on to declutter your kitchen can feel very overwhelming. I totally get the notion that having a beautifully organized kitchen seems unattainable too. But, if you follow these 10 easy tips – you’re guaranteed to achieve and master the joys of a clutter free and organized kitchen. Do not clutter your countertop. This is a mistake that most families make because they feel that the countertop is an easy place to just throw things down. It will eventually drive you nuts, and will get too overwhelming to control. Check out my last blog on Countertop Clutter!! Do an inventory of all your items. Drawer by drawer, cabinet by cabinet – to see what you actually use? What do you really need? What has not been used in a very long time? What has never been used at all? Now declutter the items that you have no use for. For some people this is hard to do. However, it is essential and the key to creating space and keeping your kitchen organized. Now that you know what items you want and need to keep, it’s time to make sure they are all separated by category. Now let’s organize all of these items back in. How to beautifully organize your items is for another day and another blog. In the meantime, the most important thing is to make the items efficient and easily accessible based on your needs. 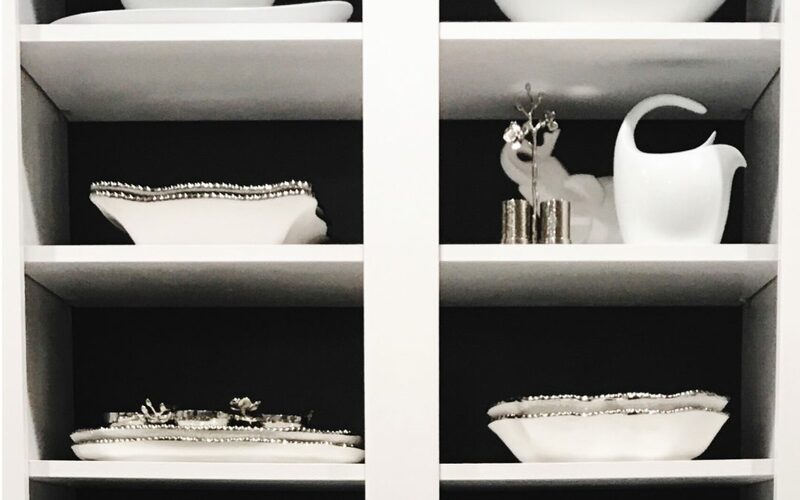 Where would be the best place for you to keep your dinnerware? Cooking utensils? Coffee & Tea? This is a decision based on your own personal needs. As long as the items are separated by category, and stored by category, with all the unnecessary items gone, you are on your way to a full declutter. The last and I truly believe the most important tip is: Do. Not. Over. Buy. If you don’t need it, don’t buy it. This refers to food and pantry items, the 20th coffee cup you don’t need, the extra mixing bowl when you have 10, so on and so forth. For every one thing you buy, try to donate, gift, or trash an item you don’t need. If you are in a store, and you see gorgeous coffee cups, first ask yourself: How many coffee cups do I have? Do I really need these? Will I toss my older ones? If not, do I have room for new ones anyway? No one said don’t buy new and wonderful things, just try determine if you really need it first. Follow these tips and enjoy your clutter-free kitchen!! !